The Georgia Bulldogs held their annual Spring game at Sanford Stadium on Saturday, April 5 in front of almost 20,000 fans. The Red team, led by the UGA first-team offense and second-team defense, defeated the Black team 17-3. 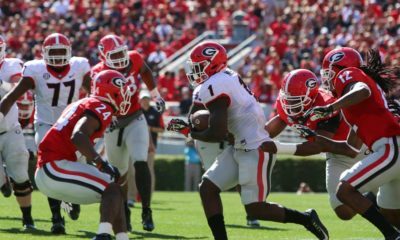 The Black team consisted of the UGA second-team offense and first-team defense. Matthew Stafford completed a 30-yard touchdown pass to flanker Michael Moore to open up the scoring for the Red team. The Black team responded with a 47-yard field goal by Andrew Jensen. Michael Moore caught his 2nd touchdown pass in the 2nd quarter, this one from redshirt freshman Logan Gray. The last score came at the end of the half when Brian Behr booted a 52-yard field goal for the Red team. Stafford led all passers by completing 6 of 10 passes for 78 yards and one touchdown. Joe Cox, who started for the Black team, completed 7 of 11 passes for 69 yards. Redshirt freshman Caleb King led all rushers with 31 yards on 6 carries. Knowshon Moreno only rushed 3 times for 16 yards for the Red team.